The Dog Watch by Hugh Sawrey is a fine art Gcilee print on canvas with an image size of 45x45cm and limited to an edition of 250 only. The Dog watch was a job that ringers took turns doing. While the other slept, one would stay awake to watch over the mob for any wild dogs in the vicinity. They would make short work of the animals if they had the chance and so the dogwatch rider’s job was a very critical one. 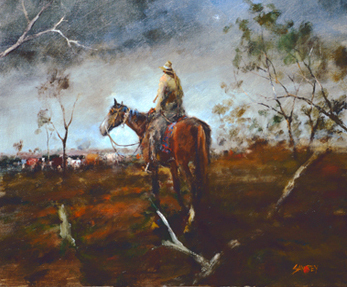 Hugh Sawrey did numerous night scenes like this one during his career and shows his mastery of paint representing the shadows and stars of a typical night on the freezing plains.